The main server component is the CASMACAT web server that runs under Apache and provides the user interface over any Internet Browser. You will find additional installation instructions in the file INSTALL.txt. It may be more up-to-date and contain more information than the instructions below. The files lib/model/matecat.sql and lib/model/casmacat.sql contain the configuration for the database. You may want to edit these files to change the name of the database, which is by default matecat_sandbox. If you do so, please change both files. First, you need to create a user account (such as catuser) and add it to the www-data group (as root). Make sure that the Apache web server reads the access file .htaccess. This may require you to edit the file /etc/apache2/apache2.conf have the following line not commented out. Apache needs to be configured to access your CASMACAT web server installation. This is done with a configuration file in /etc/apache2/sites-available that is linked to from /etc/apache2/sites-enabled. Also, Apache needs to have mod_rewrite turned on. If you now point your web browser to your site, you should see the following screen. 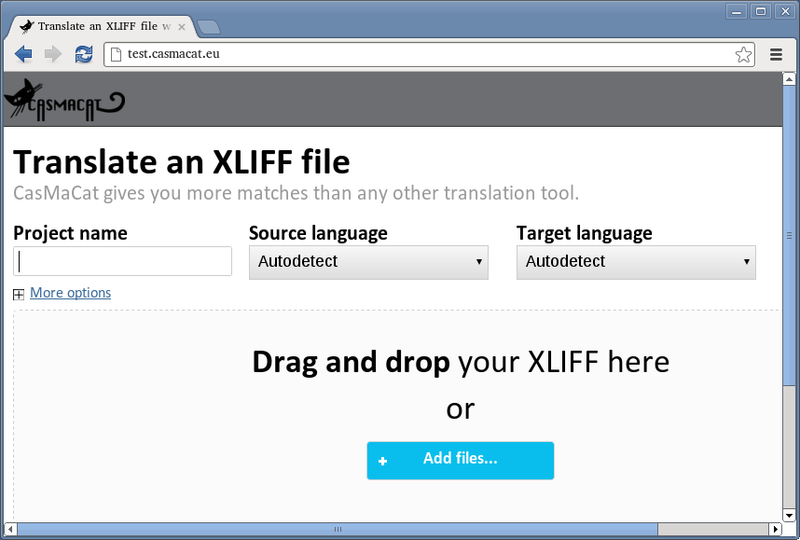 To use the tool, you will have to set up a translation engine (instructions are given for both Moses and Thot systems).